*For a list of compatible OS and devices for this app, check here. *The wireless communication range between the camera body and a smartphone is approximately 10 meters. 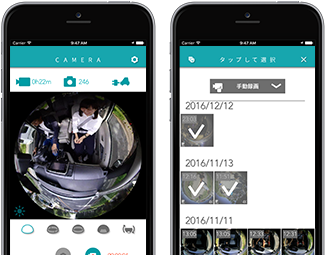 On your smartphone, you can wirelessly operate the camera. Your smartphone will show a list of recorded videos and images which can be downloaded to your smartphone. Downloaded videos and still images can be played in four different views. 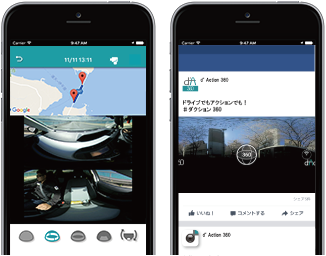 You can also convert still images into “360-degree panoramic views”, which will allow you to post panoramic images to Facebook and LINE. *Your PC must meet the requirements as stated on the List of Supported Devices/OS. Please review this prior to download. *Downloading the software may take a few minutes. 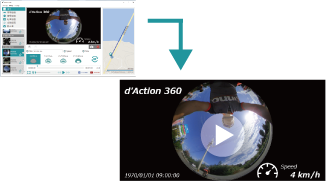 You can view and play your 360-degree videos and images in four types of view. You can also rotate the screen and play videos in fast-forward / frame-by-frame. 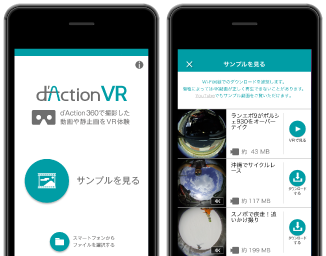 You can post your 360-degree videos to YouTube and Facebook. You can capture your playback screen to MP4 video as you see. Click “click here” to download the zip file. Extract the downloaded zip file. *Right-click on the zip file, then click File > Open All to unzip. Double-click the “DAction360Setup.msi” file in the generated folder to execute it. Please execute the file while connected to the internet. After the installation is complete, double-click the “DAction360” software added to your Windows startup menu to run. *Due to the limitations of Virtual Reality headsets, limitations to the size of your smartphone may apply. 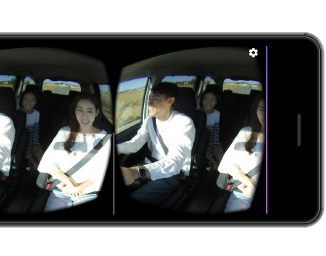 You can watch your videos in virtual reality using a VR headset. Just store videos on your smartphone and select them within the App. you can still enjoy a great VR experience by downloading some of our sample videos.